It's easy to find a gluten-free Worcestershire sauce. Lea and Perrins, the most popular brand, is safe for those who are eating gluten-free, and there are several other choices, including one that's gluten-free and vegan (most Worcestershire sauces contain anchovies, which means they're not vegetarian or vegan). However, most Worcestershire sauces sold in the United States are not considered safe on the gluten-free diet. The good news is there are three brands that are safe. Worcestershire sauce gets its distinctive flavor from the tamarind tree, which produces pods that are used in cuisines worldwide. However, it generally gets its distinctive dark brown color from soy sauce, and that often is not gluten-free. Soy sauce most often is the problematic ingredient in Worcestershire sauce. Therefore, you can't just consume any brand of Worcestershire sauce and assume it's okay, because the odds are good that it will include wheat-based soy sauce. Read on for the best Worcestershire sauces to buy when you're following the gluten-free diet. Annie's Homegrown: Contains gluten. Many people turn to Annie's for vegan and organic alternatives to mainstream foods, and some of the brand's products are gluten-free. Unfortunately, Annie's Worcestershire sauce contains wheat from conventional soy sauce. Steer clear. Bourbon Barrel: Contains gluten. Bourbon Barrel's Worcestershire sauce is a different take on the popular sauce: it's made with sorghum and apple cider vinegar, both of which give it a sweeter, tangier flavor, it's vegetarian (no anchovies), and it's aged in bourbon barrels. Unfortunately, it also contains conventional wheat-containing soy sauce. The bourbon barrel aging might be problematic from a gluten standpoint (since some people react to bourbon, which is made from the gluten grains wheat and barley). But it's definitely problematic because of the wheat-containing conventional soy sauce. It's not gluten-free, so avoid. Bull-Dog: No gluten ingredients. This is a Japanese brand of Worcestershire sauce that's also available in the U.S. through Amazon and other outlets. The Tokyo-based company, with its feisty-looking bulldog emblem, makes several different popular condiments, primarily for Japanese and Chinese markets. Bull-Dog's Worcestershire sauce does not include gluten-based ingredients (notably wheat-containing soy sauce). However, the company does make other sauces with gluten-based ingredients in the same facility, so you can't count on this being protected from gluten cross-contamination. French's: Gluten-free. This is one of the more popular brands of Worcestershire sauce in the U.S. It contains distilled vinegar (which can be derived from gluten grains), molasses, corn syrup, caramel color (gluten-free), anchovies, tamarind, and spices. This brand often is in use at restaurants and in other foodservice applications. French's Worcestershire sauce is labeled "gluten-free" by the company. Heinz: No gluten ingredients. This Worcestershire sauce contains white distilled vinegar (which most often is sourced from corn), molasses, high-fructose corn syrup, non-wheat-based soy sauce, and various spices. The Kraft Heinz company's policy is to clearly label sources of gluten, and none are present in this sauce, so it does not contain gluten ingredients. However, Kraft Heinz does not consider it gluten-free, potentially because of undeclared gluten in ingredients it sources from other distributors, and potentially because of gluten cross-contamination in processing. Heinz 57 Steak Sauce with Lea and Perrins: Contains gluten. Yes, Lea and Perrins Worcestershire sauce is gluten-free (see below), but Heinz 57 steak sauce is not on the list of gluten-free steak sauces. It contains barley in the form of malt vinegar. Therefore, you should steer clear of this one. 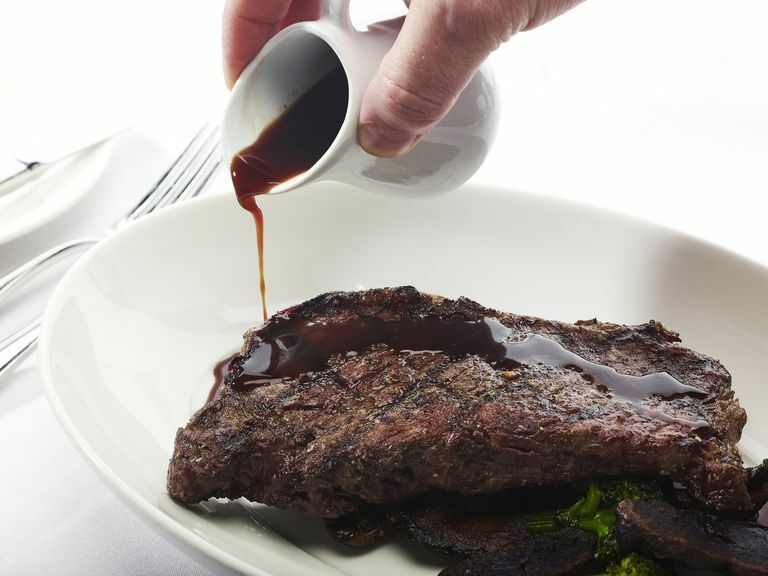 If you want a combined Worcestershire sauce-steak sauce, consider mixing a gluten-free sauce from this list with a gluten-free steak sauce—there are several good choices. Lea and Perrins Original: Gluten-free in the United States only. Lea and Perrins is the Worcestershire sauce many people picture when they think "Worcestershire sauce." The iconic paper-wrapped bottle with its maroon, black, and gold label is familiar to most who enjoy Worcestershire sauce. Ingredients include distilled white vinegar (which can be derived from gluten grains), molasses, sugar, onion, anchovies, tamarind, red pepper, and other spices. This sauce, made by the Kraft Heinz Co., is labeled "gluten-free" in the United States. Note that in versions sold in Canada and in other countries (and on Amazon), the distilled vinegar is replaced with barley-based malt vinegar, which is not gluten-free. If you're traveling, always know which version you have before you consume it. The Canadian version has an orange label, so it's easy to distinguish between the two versions. Kraft Heinz policy is to clearly label sources of gluten, including barley, on the label, so if the first ingredient is "malt vinegar" and not "distilled vinegar," don't eat it. 365 Everyday Value: No gluten ingredients. 365 Everyday Value is Whole Foods' in-store house brand. The company's organic Worcestershire sauce includes organic white vinegar (which can be derived from gluten grains), organic molasses, organic cane sugar, organic caramel color, and various organic spices. The product has no gluten ingredients but is not labeled "gluten-free." The Wizard's GF/CF Worcestershire Sauce: Gluten-free. If you want a gluten-free and vegan Worcestershire sauce, this sauce likely is your only option (short of making your own). The Wizard's brand, owned by the organic label Edward & Sons, offers this Worcestershire sauce made with apple cider vinegar, tamari (gluten-free soy sauce), organic molasses and cane juice, tamarind, and various organic spices (including Shiitake mushrooms). Note that Edward & Sons makes two different versions of Worcestershire sauce: the Original Organic Vegan Worcestershire includes wheat-based soy sauce, so make certain to purchase the GF/CF (gluten-free casein-free) variety. The one that includes wheat-based soy sauce has a red and purple label, while the one that includes tamari has a white and purple label. The company notes that the gluten-free variety has a slightly sweeter flavor than the gluten-containing product. Wine and Pepper: No gluten ingredients. This non-traditional take on traditional Worcestershire sauce includes sherry and hot pepper, making it a bit more like a thicker sherry pepper sauce than a Worcestershire sauce. Ingredients include vinegar, corn syrup, anchovy, tamarind, spices, red peppers, sugar, and sherry wine. Wine and Pepper Worcestershire sauce doesn't include gluten ingredients, according to the company. The vinegar used may include vinegar made from gluten grains. If you're looking for a ubiquitous Worcestershire sauce you'll find at any grocery store, you're safe with Lea and Perrins Original, which is considered to be gluten-free. If you'd prefer a vegan sauce, The Wizard's is your best bet. It's important to note that Worcestershire sauce in other countries—notably the United Kingdom and Europe—often does contain gluten in the form of barley-based malt vinegar. You should avoid Worcestershire sauce when traveling (and unfortunately, other condiments, such as relish and pickles) unless you know for certain that malt vinegar wasn't used. What Can I Buy If I Need Gluten-Free Salsa?